Permanently label all of your important items! 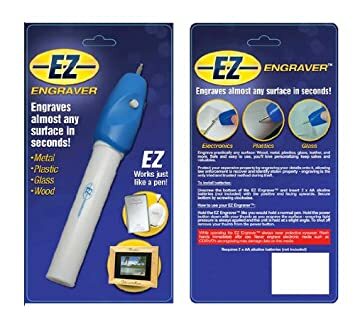 "Engrave It" engraving tool allows you to engrave nearly anything you can imagine on almost any type of surface: wood, metal, plastic, leather, glass and much more. Engrave practically any surface: wood, metal, plastic, glass, leather and more. Safe and easy to use, you will love personalizing keepsakes and valuables. Protect your expensive property by engraving your details onto it; allowing law enforcement to recover and identify stolen property - engraving is the only tried and trusted method during theft.